Looking for a stocking stuffer idea? We just added this delicious little gift set to our website and we hope you love it as much as we do! Our Holiday Season Celebration Gift Set would make a great stocking stuffer or a special gift for yourself. This set comes with four of our favorite autumn and winter diffuser blends: Joyful Joyful, Holiday Spice, Samhain Night, and Scandinavian Winter. 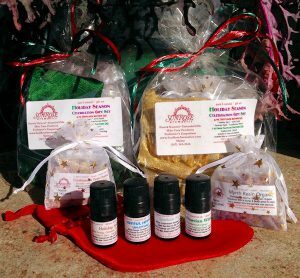 Also included are 1-ounce bags of frankincense and myrrh incense resins, a charcoal briquette to burn them, and an adorable red Christmas stocking. Best of all, this sweet treat is only $15.50! The Holiday Season Celebration Gift Set is only available for a limited time, so be sure to get yours today. in the continental USA only. but a ritual of reassurance. SunRose will be closed Christmas Eve and Christmas Day. this is the week we will be doing inventory. will not be shipped out until January 2nd, 2014. Safe travels if you are visiting with your family. and every window open to great possibility. this youtube video will start off the Christmas Season. On the first day of Christmas SunRose gave away to me ..
a 1 year subscription to The Essential Herbal Magazine.!!! Each day we will do a blog announcing the ‘Give a Way’ and Winner.!!! by Boris of Essentially MeUK. (Boris is Alec Lawless Stroud’s alter ego) Boris demonstrates fining and cold filtration to remove cloudiness from natural fragrances/perfumes. To make your shopping easy, please visit our Gift Idea Page. valid in the USA & UPS Ground only. Angel Terra Cotta Stone passive diffuser with Joyful Diffuser Blend. Leave a comment on this blog post to be entered into our December Give A Way.! Nov 2009 Blog Winner / Christmas Shopping! with the New Year .. new beginnings. The Internet makes it an effortless way to shop, no stress, no worrying about parking, crowds, traffic. So, grab yourself a cup of your favorite beverage and surf the net for your Christmas gifts. Remember shipping takes a few days .. so, as the count down is on .. plan ahead.! Karen Hohman Almeida – please contact us with you shipping information. Just a bit of a reminder when shopping this year, Please, do NOT get caught up in marketing hype re: labeling .. take a moment to read & be an informed consumer. Blog post from October 24, 2007 : What’s in that bottle?? One More Time: There are No FDA Ctf Pure Therapeutic Grade Essential Oils. There is so much more, visit our website and poke around ..
We really hope we can make this Christmas an effortless and fun experience for you.! ‘ Perhaps the best Yuletide decoration is ..